Epic Games seems to delight in keeping Fortnite players guessing at where the colorful battle royale will go next. Season 4 was heralded by a comet crashing onto the Earth's surface (at least I assume Fortnite takes place on Earth), while Season 5 tore through the fabric of space-time. No one knows what Fortnite Season 6 will bring, but according to a recent datamine, there's one thing it likely won't feature: those dimensional rifts currently hovering in the sky. Like previous Fortnite leaks, Twitter account Fortnite: Battle Royal Leaks has discovered in a recent datamine shows that rifts are slowly shrinking, and will close completely on August 21. What's interesting is that Fortnite Season 6 isn't slated to start until much later - September 17, to be precise. However, this isn't too different from what happened between Seasons 4 and 5. 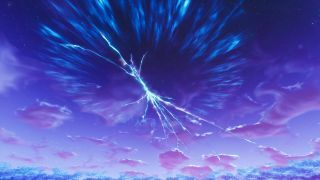 As Season 4 was winding down, an in-game rocket launch caused the aforementioned cracks in the sky. In-game items (such as the googly-eyed mascot of Durr Burger) started appearing in the real world, and the Fortnite map itself got some major overhauls. In other words, just because we don't what what, precisely, is coming doesn't mean you shouldn't pay attention. And considering that these rifts tie in to Fortnite's Battle Pass Challenges, you might want to enjoy them while you can. If you haven't memorized them yet, here's a guide showing you all rift locations. Strange though they may be, Fortnite's rifts aren't the strangest thing in the game. Check out our list of Fortnite myths and rumors to see what's actually kooky and what's just made-up.